Deaf Radio is a guitar based desert/heavy rock band from Athens, Greece, formed in 2015. On January 2017 the band releases their debut album “Alarm” on vinyl, which attracts the attention of the music industry, gains favourable critics around the world and gets sold-out within the first three months. The album is characterized as a “masterpiece” while the release gig that follows in Athens is performed in front of an ecstatic sell-out crowd. The recognition of “Alarm” as one of the best albums of the Greek music scene for this year, was for the band the ticket to Ejekt Festival 2017, where they shared the stage with The Killers, The Kills and Circa Waves in a performance marked as remarkably successful. 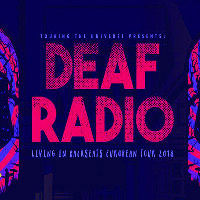 Having introduced themselves to the local audience by the summer of 2016, Deaf Radio toured Europe in 2017 and opened the two historic shows that Planet of Zeus played in Athens to mark their 10-year-anniversary. Heavy riffs and massive drum patterns that blend together with characteristic vocal lines define Deaf Radio's music, This way they create an explosive and once dark-almost pagan atmosphere. Their lyrics are overwhelmed with existential and sometimes dystopian thoughts bringing to surface their inner worries and concerns.